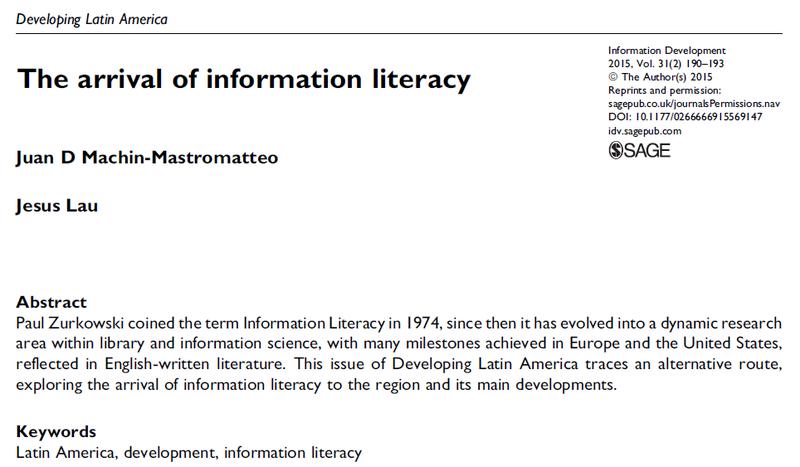 Jesus Lau and I just published an article where we remember and explore how did information literacy (infolit) get in the Latin American region. You may find it in the second issue of Developing Latin America, available in the journal Information Development, published by Sage. The most important elements in this article are two tables, one of them ranks Latin American countries by their academic production regarding infolit (with data gathered from the AlfinIberoamérica wiki) and the other table highlights the eight infolit declarations that have been made in the region, their date, place and the name of the event or declaration. Abstract: Paul Zurkowski coined the term Information Literacy in 1974, since then it has evolved into a dynamic research area within library and information science, with many milestones achieved in Europe and the United States, reflected in English-written literature. This issue of Developing Latin America traces an alternative route, exploring the arrival of information literacy to the region and its main developments. By judamasmas in Developing Latin America, Research on 2015/02/23 .